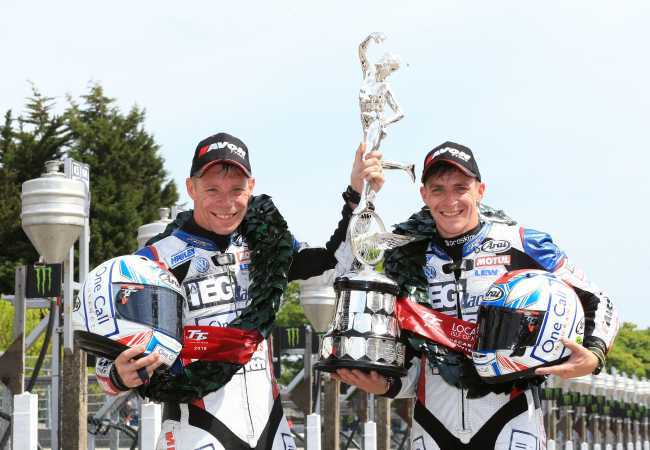 Ben and Tom Birchall created history in Friday morning’s second Locate.im Sidecar TT Race at the 2018 Isle of Man TT Races, fuelled by Monster Energy, when they became the first crew to lap the Mountain Course in under 19 minutes as they swept to their second win of the week, also breaking their own race record from Saturday in the process. The Nottinghamshire brothers overhauled early leaders John Holden/Lee Cain at the end of lap one and with their second lap being a stunning 119.250mph, they eventually won by 22.92s with Tim Reeves/Mark Wilkes again finishing third. Holden/Cain led through Glen Helen on the first lap, their advantage over the Birchalls 1.4s with Reeves/Wilkes only 0.78s adrift. Patrick Blackstock/Lewis Rosney were going superb in fourth as Alan Founds/Jake Lowther and Dave Molyneux/Dan Sayle completed the early top six. By Ramsey, Holden/Cain had eked out an extra two tenths of a second over the Birchalls but Reeves/Wilkes were dropping back, now 5.1s behind. There was change behind though as Founds/Lowther and Molyneux/Sayle moved up to fourth and fifth respectively at the expense of Blackstock/Rosney who’d dropped off the pace slightly. The Birchalls had a quicker run up and down the Mountain to seize the initiative and an opening lap of 117.185mph meant they went into lap two with a lead of 1.89s over Holden/Cain. Reeves/Wilkes broke the 116mph barrier for the first time to maintain third and they were still only 5.5s behind Holden/Cain. Founds/Lowther and Molyneux/Sayle were still in fourth and fifth but Conrad Harrison/Andy Winkle had now moved up to sixth. Meanwhile, history had been made further back as Estelle Leblond/Melanie Farnier became the first female driver to go above 110mph and her lap of 110.732mph saw her slot into ninth place. Newcomers Michael Jackson/Harry Payne were also going well, their lap of 108.521mph putting them in 13th. The Birchalls were pressing on at the head of the field and they had extended their lead over Holden/Cain at Glen Helen to 4.6s who, in turn, added another half second to their advantage over Reeves/Wilkes. 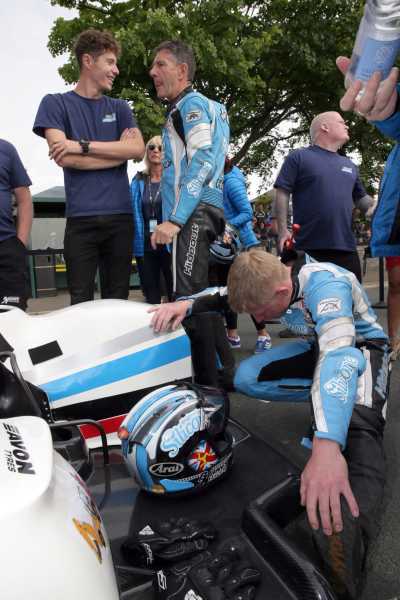 Fourth to sixth remained the same but Blackstock/Rosney were now back in eighth while Pete Founds/Jevan Walmsley were reported to be experiencing problems and eventually retired at the end of their first lap. 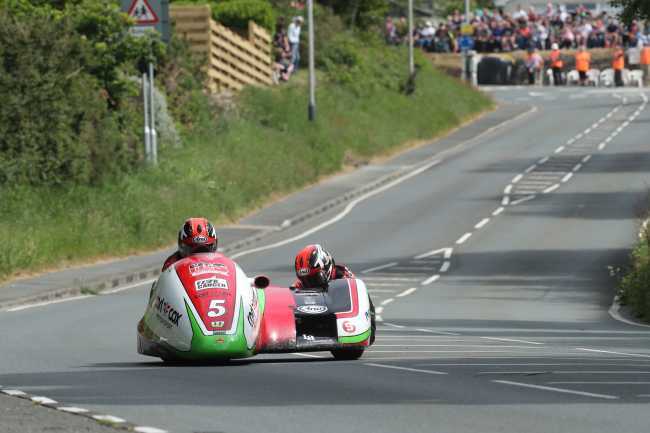 Throughout their second lap, the Birchalls increased their lead and a new lap record of 119.250mph – the first sub-19 minute lap for the sidecar class – saw them surge clear of Holden/Cain, the difference now a more comfortable 15.1s. Holden/Cain lapped at 117.878mph with Reeves/Wilkes setting another personal best lap of 117.729mph to slot into third, seven seconds behind Holden/Cain. Holden/Cain and Reeves/Wilkes completed the podium, just as they had done in the first race. Founds/Lowther took fourth and Blackstock/Rosney and Harrison/Winkle took fifth and sixth while 17 time TT race winner Molyneux/Sayle retired on the final lap. Gary Bryan/Phil Hyde, Steve and Matty Ramsden, Leblond/Farnier and Gary and Daryl Gibson rounded out the top ten. Photo Stephen Davison / Pacemaker Press Intl. PICTURE BY DAVE KNEEN/PACEMAKER PRESS.